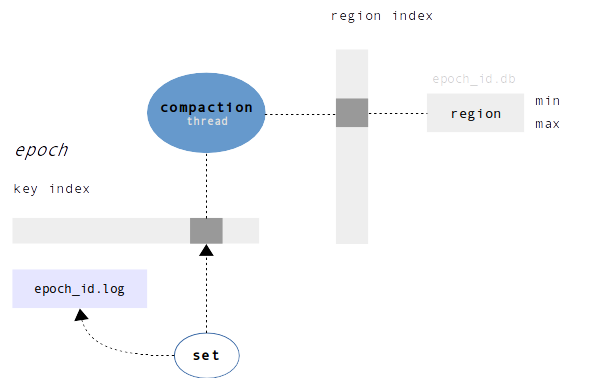 Original Sophia&apos;s architecture combines a region in-memory index with an in-memory key index. A region index is represented by an ordered range of regions with their min and max keys and latest on-disk reference. Regions never overlap. These regions have the same semantical meaning as the B-Tree pages, but designed differently. They do not have a tree structure or any internal page-to-page relationships, thus no meta-data overhead (specifically to append-only B-Tree). A single region on-disk holds keys with values. As a B-tree page, region has its maximum key count. Regions are uniquely identified by region id number that makes them trackable in future. Key index is very similar to LSM zero-level (memtable), but has a different key lifecycle. All modifications first get inserted into the index and then hold up until they are explicitly removed by merger. The database update lifecycle is organized in terms of epochs. Epoch lifetime is set in terms of key updates. When the update counter reaches an epoch&apos;s watermark number then the Rotation event happen. Each epoch, depending on its state, is associated with a single log file or database file. Before getting added to the in-memory index, modifications are first written to the epoch&apos;s write-ahead log. The merger thread is the core part that is responsible for region merging and garbage collecting of the old regions and older epochs. On the wakeup, the merger thread iterates through list of epochs marked as &apos;transfer&apos; and starts the merge procedure. The garbage collector has a simple design. All that you need is to track an epoch&apos;s total region count and the count of transfered regions during merge procedure. Thus, if some older epoch database has fewer than 70% (or any other changeable factor) live regions, they just get copied to the current epoch database file while the old one is being deleted. On database recovery, Sophia tracks and builds an index of pages from the earliest epochs (biggest numbers) down to the oldest. Log files then are being replayed and epochs become marked as &apos;transfer&apos;. range range queries are very fast due to the fact that each iteration needs to compare no more than two keys without a search, and access through mmaped database. Roughly complexity can be equally evaluated as sequential reading of the mmaped file.